We can see from the Calendar coming stock with the first version of iOS, the Calendar is such an important app that we cannot live without it, for it records and tracks what we are going to do and when to finish. The first thing you need to know is how to set up the Calendar and I am going to share with you some different options about setting up calendar. Step 3: Enter your iCloud email and password and tap Next in the upper right hand corner. Step 4: Turn on the services you want to sync with your iPhone or iPad, for example the Calendar. By default most, if not all, of iCloud's services are turned on. Once you're done, all your appointments will show up in the Calendar app. The iOS Settings app like Calendar contains built-in support for Google Calendar and related services so you can setup Google Calendar on your iPhone or iPad. Step 1: Launch Settings from your Home screen. If Microsoft Outlook.com is your calendar provider of choice, it's easy to set up and access it right on your iPhone or iPad. 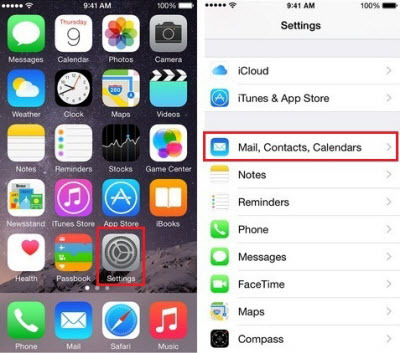 Below are the steps about how to set up Microsoft outlook calendar on your iPhone or iPad. Step 2: Tap on Mail, Contacts, Calendars. Step 3: Tap on Add Account. Step 4: Tap on Outlook.com. Step 5: Enter your Outlook.com username and password and then tap Next in the upper right hand corner. Step 6: Choose the services you'd like to enable and sync with Outlook and then tap Save in the upper right hand corner.